Nick Clegg says the results provide a "good platform to make gains against Labour"
The Lib Dems say they have "held their own" in European elections despite seeing their share of the vote fall. With all results declared except Northern Ireland, the party came in fourth with a 13.9% share, down from 14.9% five years ago. It means the Lib Dems, the most pro-European of the leading UK parties, will be sending 10 MEPs to Brussels. Leader Nick Clegg said the party was "growing fast at the expense of Labour" at local and EU level. He said the party was now "within a hair's breadth of Labour's share of the vote - and they run the government". He described Thursday's council election results as "very strong" and European elections results as "solid". 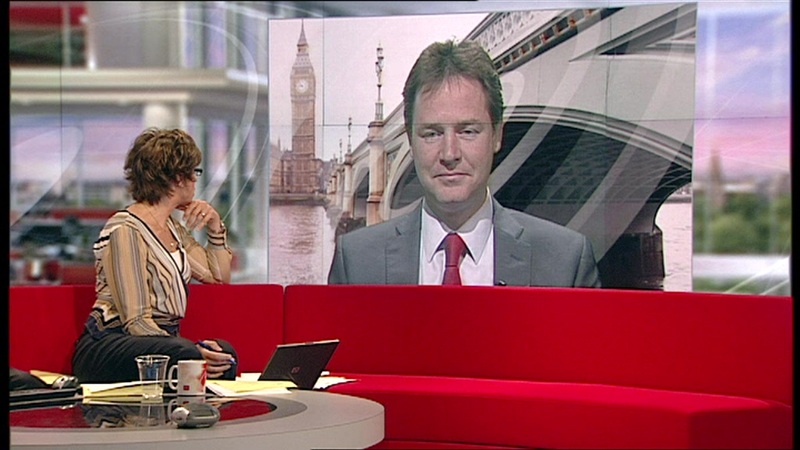 With the addition of one MEP to their contingent, Mr Clegg said: "Would I have liked to have done better? Yes, of course, but given the very volatile nature of the elections, it was a solid result." He said the pro-Europe party's message of having strength in numbers "in an unsafe world" on issues such as the economy, organised crime and climate change, had been obscured by the Westminster expenses scandal. Anger over the expenses scandal at Westminster is thought to have prompted many voters to desert the established parties, with Labour by far the worst hit. As Labour suffered its worst election in the post-war period, Mr Clegg said: "I think Labour is finished, I think they are dying on their feet. "The period of dominance in British politics over the last 12 years by Labour is over." The UK Independence Party, the Greens and the BNP were the main beneficiaries of Labour's collapse, the latter winning its first two seats in the European Parliament. The Lib Dems saw their vote squeezed in several parts of UK, notably the Midlands and the North of England. But they polled more votes in the East of England than five years ago while their vote in the South West also rose. The latter region is particularly important to the Lib Dems as they will be hoping to hold onto a number of seats there in the next general election against Conservative advances. The party lost control of both Devon and Somerset councils to the Tories in Friday's council elections. Graham Watson MEP, Leader of the Alliance of Liberals and Democrats in Brussels, said his group would continue to play an important role in the European Parliament. "It looks as if the Liberal Democrat group will come back into the new parliament about the same size," he said. "That means we should continue to hold the balance between left and right." 0 of 27 countries declared.